While their more southern neighbors in Detroit provided the basis for much of modern electronic music, there is no denying the impact that Canadian techno has had on the world. It has been a decade since Ontario native Mike Shannon launched Cynosure and Revolver Records with friend J. Hunsberger. The twin labels were set up to respectively explore the dance floor and more experimental climes of techno and house, and in the process helped to champion a range of like-minded countrymen. Shannon’s own productions explore the gamut of this ethos, whether it’s the cheeky twisted floor cuts of John Shananigans or the deeper moodier fare released under his own name through to his introspective left of field material that graced the Possible Conclusions To Stories That Never End album. For the latest LWE podcast Mike assembled an exclusive mix of forthcoming and never released tracks in the old fashioned, two turntables and a mixer way he describes as “a little raw (no effects or edits), just the way I like it…” Help celebrate the tenth anniversary of one of Canada’s vanguard techno labels by peering into this sonic crystal ball of up and coming Cynosure exclusives. Check out a full length interview with Mike Shannon after the jump. How soon into being involved in electronic music did you have the idea to set up your own record label? Mike Shannon: The idea came about when J. Hunsberger and I were a part of a Kitchener-based arts collective. The collective had many different artists involved and the idea was to make an outlet that incorporated most of the artists involved to showcase their work. Then when it came time to sign the checks the director of the Federally funded organization said no, saying that the project would only benefit myself and none of the other artists involved. I’m sure that if the label was a folk/rock imprint we would have received the money. Oh Canada! So by that point things had completely developed and it was too late to stop, we had to follow through with the plan. So we scraped every last cent we had and made it happen. You’ve made three quite different sounding albums. How much do you plan out the ideas and feel of an album before you undertake the project? All of the albums I’ve done in the past were mainly comprised of tracks or sketches or tracks that I had been working on. Then the idea to put them together kind of shaped the direction of things depending on what tracks were used. In many cases I adjusted certain tracks to fit in with other elements of the album. But so far I’ve never had a clear vision in my head of what an entire album would sound like from start to finish before I began working on it. Some artists say they do but it honestly rarely happens that way. How do you feel growing up in Kitchener, Ontario impacted your musical growth? Being smack in the middle of Toronto and Detroit definitely had some influence on my musical style. I was constantly going to parties and buying records in both cities. Toronto had more of a UK-influenced rave scene in the 90’s that most definitely had an impact on what I was first into; but at the same time I was always drawn to what was happening on the other side of the border. Once I got a taste for what was happening in Detroit musically I really couldn’t stop that addiction, and I really wanted to push that sound at our own parties and club nights in Kitchener and then eventually with my own productions. Why did you go to Chile to work on your album Possible Conclusions? Was there something specific about the country that you felt would be inspiring? I wasn’t going to Chile with the sole purpose of recording Possible Conclusions. My girlfriend and I were in Santiago to assist the Mutek festival in organizing an edition of the festival in Valparaiso. In the process I met some really amazing musicians like Uwe Schmitt (aka Atom Heart), Vicente Sanfuentez and Andres Bucci who definitely showed how much more you could explore with music. I was flirting around with some downtempo ideas since the beginning, but when I started working on this record in Chile many new directions came out of those ideas. There was definitely some magic down there that played some part in shaping things, but I think you could be anywhere in the world and listen to what someone like Uwe has done and you would be inspired. Where are you currently residing and what are you enjoying about being there? I’m currently living in Berlin these days. For me it’s really an open, carefree city. Loving it much more than I thought I would. So many good friends are based here at the moment and constantly meeting new faces from all over the world. Some great musical ideas and collaborations are coming together here and I’m sure some cool things will come out of my time here. Was there a particular inspiration behind Memory Tree? My brother was a huge factor in the inspiration behind the title and its meaning. A Memory Tree is just another way of saying an album. More specifically, a collection of works that you can relate to a moment in time or a specific feeling. The inspiration for the outcome of the sound of the album would definitely be influenced by my new home of Berlin and a lot of the changes in my life that were happening at the time. The major one for example was having a baby with my girlfriend here. The thing is the entire album was completed before she was born so perhaps this explains some of the variety on the record. So many different emotions that run through your veins during that pregnancy period. Thank god I have a creative outlet to release them! How much has changing technology played a part in your music? Do compose in the same way from your first to your most recent releases? Yes, almost the same way now. The first few records were done mainly with hardware synths etc. Then I really got into Pro Tools and was keeping things in the box and only using mainly my computer, but with Memory Tree, things have gone back to the old way and I really got back on the hardware train. I was really fortunate to have a few friends lend me some amazing synths and drum machines that I used to compose this album. I would stand up an old Roland System 100 Modular to any plug-in these days. But it’s all about the combination of digital and analog tools and how well you use them in the end. Have you had any formal training in music? My grandfather tried to teach me a few things with a guitar and a ukulele but I never really had so much interest at the time. I was already so obsessed with synth music that the guitar was just too normal for me. I was so naïve. Were you ever a part of a band, or have you always been DJ/producer oriented with music? Since I couldn’t really play anything properly I was never welcome to play in a band. I had dreams of forming a band when I was kid where I was the synth guy. Like a miniature Rick Wakeman. Yeah, I really was obsessed with DJing since I was 13 and never got into the band thing. The release ethos of both Cynosure and Revolver seem quite similar. What are the differences between the labels and the directions they cover? Revolver is most definitely the more eclectic of the two. In the beginning the label was really all about uber minimal techno and house. These days it’s evolved even more into the left field of minimal dance floor and headed to become a digital-only, more ambient downtempo label. Cynosure was always the more dance floor accessible direction but still keeping things weird enough to stand out of the crowd. Your aliases John Shananigans and Sid Dithers have both made occasional cameos on your discography. What particular area of your production do they inhabit that makes them rear their heads and stake claim to the music? Ol’ Johnny and Sid, well, they’re special characters reserved for special situations. Sid is a special guy who comes into town when the going gets tough, like a cleaner so to speak. And Johny, well he’s the more carefree, fun loving yet twisted side of my productions. John is planning a comeback and coming out with a few new EPs for 2009 that explore twisted bebop jazz side of tech-house. You seem to enjoy playing around with different genres, or rather not limiting yourself to any particular style. 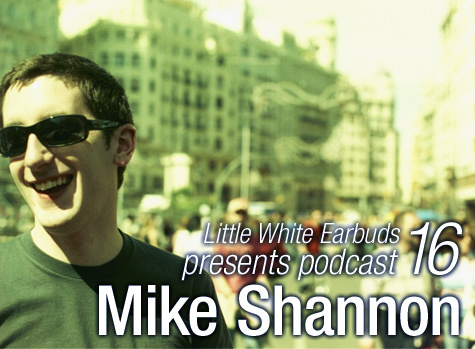 Musically, what’s really exciting you right now that may influence future Mike Shannon releases? When the weather gets colder I seem to slow things down a bit, so I’ve really been listening to a lot of cinematic music these days from producers like Henri Mancini and Barry Adamson. But also a lot of blues and New Orleans funk to keep my blood pressure high enough. Any upcoming Cynosure or Revolver releases with new talent to look out for? On Cynosure there is the new EP from Horror inc. aka Marc Leclair that will be coming out before the end of 2008, the first EP he’s done in over 5 years — fingers crossed. Then for early 2009 we’ll have another EP from Brett Johnson featuring remixes form Chic Miniature, a new John Shananigans EP and another EP from Andrea Fiorito. Revolver has an exciting new downtempo EP from Jeff Samuel coming out late this fall. By far one of the best things that I’ve ever heard from Mr. Samuel. What can we expect from you over the next year’s time? I’ll be continuing with my own productions and remixes. Saving the dance floor style for the remixes and trying to explore a new sound for a future project. Deadbeat and I will continue to work on our analog madness project together and hopefully not hurting anyone too badly with the results. We’re still not sure what it’s called yet but I’m sure you’ll hear about it in late 2009. This is one killer set. I’m proper feelin’ this. id have2 say that im proud to be knowing the likes of mike shannon from back in the day.. ktown dizko has permiated the underground worldwide.. due props.. theewizard..